Beautiful detached 2 bedroom villa with en-suite master bedroom, private pool and sea views!!! Located on a quiet residential area. Five minute walk to the beach, 10 minutes away from bars, shops and restaurants, what more could you want!!!! 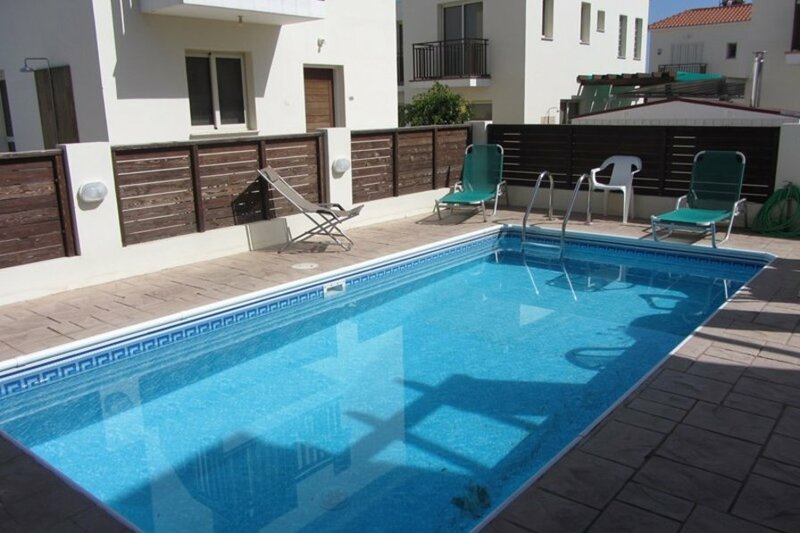 Luxury Detached 2 Bedroom Villa has its own private pool and en-suite to master bedroom. This villa has sea views to the rear of the property; it is tastefully furnished and decorated. The rooms are well appointed and spacious. The villa is in a small mainly residential close, tastefully furnished throughout, all windows and patio doors have fitted blinds and the villa is air conditioned throughout. On the first floor there are two bedrooms one of which is en suite, and a family bathroom. Both bedrooms have private veranda, the bedroom located at the back of the villa has beautiful sea views and is overlooking the pool. In the garden at the rear of the property there is a private 8m x 4m swimming pool and a pool side shower, a BBQ and a set of pool side furniture. By the pool there are sun loungers and a parasol. The villa is located in the resort of Kapparis. The coast is just a few minutes walk and there are numerous small beaches all along this coastline within walking distance. The main centre of Kapparis is approximately 10 minutes walk and here you will find a selection of international restaurants (Italian, Chinese and Greek), bars, shops and supermarkets. Kapparis is on the main bus route for an hourly bus service that takes you to all the local towns and resorts such as Protaras, Pernera, Ayia Napa and Paralimni. A refundable damage deposit of 200 euro is payable on arrival . Electricity:	100 KwH per week are allowed. 30 cents is payable for each Kwh above the allowed 100 KwH per week. The Air Con units are very effective and only take a few minutes for the room to reach the desired temperature. Five minutes drive along the coast is the family friendly coastline resort of Protaras with its famous white sandy beaches and, in particular, Malama and Trinity beaches where children can splash all day and you can find activities such as snorkeling, jet-skiing, parasailing. For the night life lovers, the action-packed resort of Ayia Napa is a short drive 15-minute drive from the villa. For the more adventurous, most of the island is within easy reach via a good road system; the villa is well situated, within approximately 10 minutes of the eastern end of the main east/west road, which traverses the island. Ayia Napa villa provides a holiday experience to remember. Its relaxing atmosphere is all you ever dreamed of.